Pioneers in the industry, we offer polymer conveyor rollers and polymer conveyor roller from India. Shree Polymers receives a large number of orders for Indsutrial Polymer Conveyor Roller, owing to its high quality. We are manufacturing these rollers using latest engineering techniques and technologies. 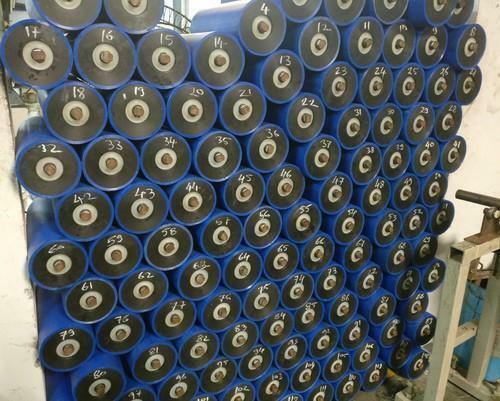 The demand of these products is continuously on rise, as its counterparts like metallic rollers or MS rubber lined rollers have many disadvantages, that are not present in the industrial polymer conveyor rollers. Few of the benefits of these products include exception abrasion resistance, good corrosion resistance, and low coefficient of friction. This special roller for different industries performs optimally even in harsh environments and open conditions. Non-Stick: This property is very helpful in eliminating the carrying over of the foreign particles such as urea, gypsum & other powder material. Consequently, this helps in the condition of slippage by increasing the loads at head and tail pulleys. MoC: Avant-garde material of construction ensures finest performance in harsh environments.